by Tahir Yaqoob, Ph.D. Updates to the Book. This page is for readers who already have the book. Please also visit the corrections page. Below are some updates to the book prompted by recent developments and results. I do not report every “blip” of new information, but restrict the material to only items that are robust and that are significant for keeping the book Exoplanets and Alien Solar Systems up-to-date. Information such as the number of exoplanets discovered to date, and the breakdown of those numbers into various subcategories, changes almost daily, and the book already explains how to keep up-to-date on those kinds of things. 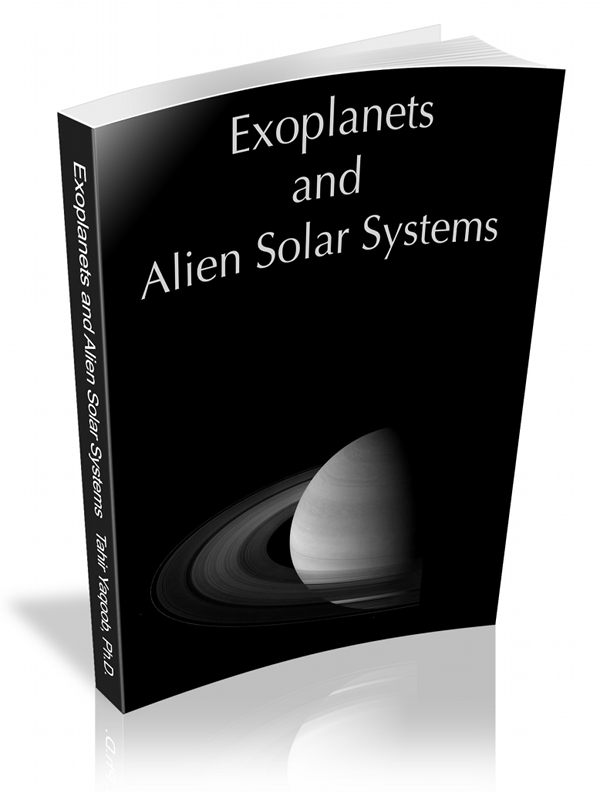 The diagrams and figures in the book have been updated to the point where the total number of confirmed exoplanets was 777, residing in 623 alien solar systems, 105 of which were multiplanet systems (these numbers pertained on 5 August, 2012). The updated diagrams and figures can be found at appropriate places on the exoplanets.co website (under Tutorial), along with discussions pointing out any necessary modifications in interpretations, and or conclusions. The updates below are ogranized according to the original subheadings in the book. Why Don't Exoplanets Have Names? The discovery of exoplanets in the Kepler-20 and Kepler-22 star systems prompted mainstream discussions of the failure of scientists to come up with names of exoplanets that are not sterile and boring. For example, in this article scientists are quoted concurring with my view that it is necessary to come up with a system for better public engagement, supporting the view expressed in my book that not doing so is in direct conflict with goals to educate the public. The article even reports on a facebook-naming contest. What will transpire officially, we will have to wait and see. What Can We Actually Measure? Unfortunately, science reporting in popular media and space blogs continues to erroneously confuse assumptions with conclusions. After all that is taught at schools, colleges, and universities about proper scientific method, what message is conveyed when, in the end, the output from research, and disemination to the public, is thrown out of the metaphorical window? The announcments of the discovery of Earth-sized planets around a sunlike star outside of our solar system in the popular media have included statements along the lines of “..both planets are rocky..” and “..theoretical calculations suggest masses of..” for the exoplanets Kepler-20e and Kepler-20f. However, the rocky composition is an assumption, not a deduction. The “theoretical calculation” simply takes reasonable density values corresponding to the assumed composition and simply multiplies by the volume to get a mass range. A 9th-grade high-school student could do this “theoretical calculation.” The masses, therefore, are also assumptions, not deductions. As explained in the book, there is a bit of a grey area as to the first exoplanet that was discovered because the earliest findings were tentative and were claimed as exoplanets years later. The discovery years adopted in Exoplanets and Alien Solar Systems are explicitly those reported by the Extrasolar Planets Encyclopedia. Read more detail about this issue: When was the first exoplanet discovered?. In Exoplanets and Alien Solar Systems I pointed out the looseness of the term “Earthlike,” and how nobody has really addressed this properly. However, the issue has now bubbled to the surface as the Earth-sized exoplanets Kepler-20e and Kepler-20f were announced, creating confusion as to whether they were Earthlike. The conversation has begun, and, for example, the Planetary Habitability Laboratory has proposed the use of a constructed quantity called the Earth Similarity Index (ESI). However, there are several problems with this: please read the article on ESI for more details. Two Earth-sized exoplanets have been upgraded from candidate to “confirmed” status (Kepler-20e and Kepler-20f). Earth-sized does not mean Earthlike, however. As explained above, the masses are unknown, their composition is unknown, and desipte quotes of temperatures in the media etc., their temperatures are unknown (see below). There are now, as of the begining of 2012, nearly double the number of candidate planets in the Kepler data compared to the number 1,235 given in the book. The number of confirmed candidates grows steadily. Check the Kepler website for the latest numbers of Kepler candidates and confirmed exoplanets. The exoplanet Kepler-22b is now recognized as the first exoplanet that has a measured radius, and is located in the habitable zone of its host star (i.e. the habitable zone calculated from the particular criteria adopted by the Kepler team) . The paper by Borucki et al. (2011, arXiv:1112.1630B) gives a radius of 2.4 Earth radii. The mass of Kepler-22b and its composition are unknown. Although an “equilibrium temperature” of around the freezing point of water is given, it may be wildly different to the actual temperature of Kepler-22b (which is completely unknown). As I advocate in Exoplanets and Alien Solar Systems, the various definitions of habitable zones are too restrictive, and more and more scientists in the field are realizing that, given some of the unexpected forms of life on Earth, the search for life should be widened to include a wider range of physical conditions. There has even been a proposed Planetary Habitability Index (PHI). However, at some level, such an index is still likely to be biased by what we might expect. Is There a New Answer to the Old Question? Readers may have noticed that I did not explicitly refer to the absence of communications with life-forms from worlds outside of our solar system as the Fermi Paradox, even though that is the usual term of reference. That's because I think that use of the word paradox is inappropriate in contexts such as this one. It usually means simply that something is wrong in the line of reasoning, and/or in one or more of the assumptions.